“Yes! Addan naan-anay a danum para kanya mi nga umili. Masolbaren ti umanay a pagririan mi nga partuaten ti kinakurang ti danum”. (Yes! Finally there is adequate water for us in the community. As well as solving whatever misunderstandings amongst us brought about by lack of water). These were the words of Belly Alcalde, a barangay health worker and a woman leader upon witnessing the first burst of water coming from the newly rehabilitated artisan well in Barangay Palaquio in the municipality of Bucay, the province of Abra. In the second half of 2014 barangay Palaquio had requested the assistance of the Center for Development Programs in the Cordillera (CDPC). CDPC thru its partnership with SOLIDAGRO (a Belgian NGO), and the Provincial Government of East Flanders (PEF), Belgium responded favorably to help the community in their long standing problem in water inadequacy. 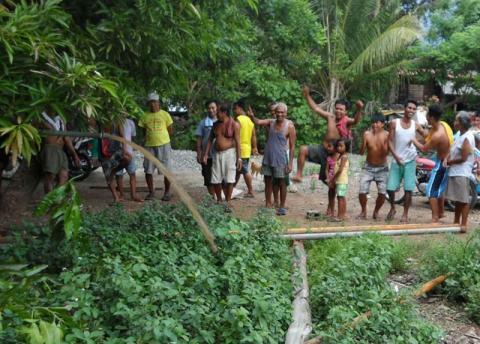 With the active community participation, thru their people’s organization the “Palaquio, Bucay Farmers Association (PBFA)” and with the full cooperation of their barangay council members headed by barangay Chairman Juanito Alvarez, development of Palaquio water system is a success. Barangay Chairman Juanito Alvarez, who is also a member of the PO, led the mobilization of the community members with his encouraging words “Parabor ken agserbi kadatayo daytoy a proyekto. Daytoyen ti mangsungbat iti nabayag nga kalikagum tayo nga maaddaan iti naan-anay nga danum. Masulbaren ti kinakurang ti danum nga umanay a pagriririan tayo” (This project is a gift/blessing to us that benefits us all. And this is the answer to what we have been longing for, to have enough supply of water. This will also solve our problem in water, which caused misunderstandings between and among us). Works involved in the development of the said artisan well are provisions of an electric 2 horsepower submersible pump, installation of stainless intake tank as well as a mainline pipe to ensure that every cluster of households have access to water. The water source has a discharge of 2liters per second, and from the average of 6 hours operation per day it can produce a total discharge of about 43,200 liters per day which is adequate enough to supply 1,048 total population of Palaquio in a span of more than 10 years given that per individual consumes 45 liters per day. The project started on June 16, 2015 and completed on July 3, 2015. The terminal assessment and blessing ceremony of the project as requested by the community was held on August 17, 2015. In the assessment meeting, a draft policy was finalized. One provision in the policy is a maintenance fee of twenty (20) pesos per month per family. In closing the ceremony Joel Taeza the Chairperson of the PO expressed their utmost thanks.“Dakkel nga pagyamanan mi kanya yo nga taga CDPC ta pinatgan yo ti dawat mi nga umili, dakkel ti tulong na daytoy a proyekto kanya mi. Saan laeng nga nasolbar ti problema mi iti danum, ngem mas pay nga napairut ti panaglalangen mi nga umili as kas agkakabsat. Saan kayo nga agdanag ta akem mi nga mangsalwad ken mangisakit tapno agnaynay nga usaren mi nga umili ti proyekto” (Our utmost gratitude to CDPC for considering our project request. This project is a big help to us and not only because it solved our problem in water but also made our unity stronger as community and made us relate with each other as real brothers and sisters. Rest assured that we will cherish this project and it’s our task to protect and sustain this project so that it will serve us for a longer period).